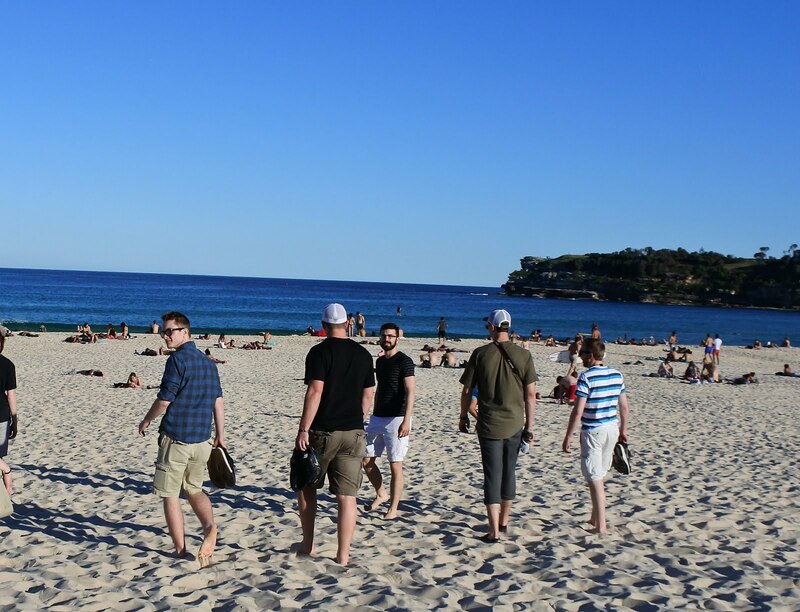 Upon arriving in Sydney, the group enjoyed a full day of sightseeing. Approximately 20 hours after leaving Minneapolis, we arrive in Sydney; now May 17th at 7a.m. If it seems as though the math doesn’t quite work out, it’s because we have indeed lost an entire day, thanks to those pesky international date lines. We can now all make the claim that we were non-existent on May 16th. We later found out two members of our group actually had birthdays on the 16th! Now since we are a group of CSE students, I’ll take the liberty of doing some statistics. The chances of any two students having the same birthday is about 0.27%; the chances of that day to also be the day we miss flying to Australia? Well I’m not entirely sure what the possibility is, but I imagine it to be quite low. On our bus tour we got a little taste of Sydney and a little history lesson of Australia. We drove through various parts of Sydney including Chinatown, which boasts to be the second largest in the world, right after San Francisco. We did a quick drive-by of Darling Harbor where we witnessed the boom of tourism and the construction of high-end hotels and casinos to accommodate it. Next we went through the Rocks—the birthplace of Sydney. The beautiful roads cut through large rock structures, thus giving it its name. It’s quite amazing to see how the city was built, and I could only imagine how difficult it must have been. Sydney was started as a place for England to send their convicts, or a sort of a prison island, so the Rocks was actually where most of the convicts lived. It was deemed as an “undesirable” area of Sydney, but is now a charming old town full of history. Then we arrived at Sydney Harbor Bridge and the Sydney Opera House, we had a quick pit stop here. As we exited the bus, there was a great sense of awe, and rightly so! It’s quite unbelievable how gorgeous the Sydney Opera House was, across the sparkling ocean against a backdrop of the city and the bridge just out of sight. After reluctantly leaving the Opera House, we had lunch at Phillips Foote’s BBQ, and had a surprise birthday celebration for the lucky two who managed to lose their birthdays. After a nice break with full bellies, we drove through King’s Cross, which was a sort of red light district in reform, and through the business district of Sydney to Macquarie Lighthouse and Mrs. Macquarie’s chair. Finally after a long day of sightseeing and jet lag kicking in, our final stop was to Bondi beach. A beautiful beach filled with locals and tourists alike. It was a perfect end to our first day in Sydney. Sounds like a great first day in OZ! Glad to hear the missing birthday duo received recognition and celebration.